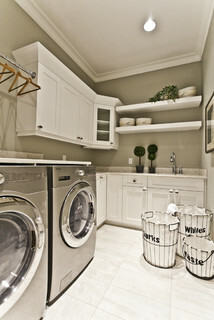 Here's where I collect together laundry room design ideas that demonstrate (or fail to demonstrate) the principles of laundry room design and the ideas set out in how to design a laundry room. I find interior design photos of laundries quite strange because they don't usually have any laundry in them - maybe some folded towels but never a pile of dirty sports kit and shirts hanging ready to be ironed. 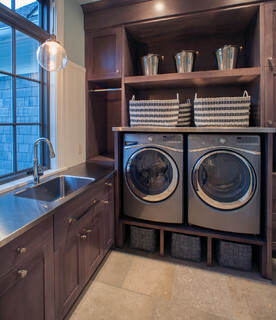 Here's a great example of a laundry using built-in pedestals rather than those from the manufacturer. There's a small amount of space for hanging shirts to dry or to keep them crease free after ironing. 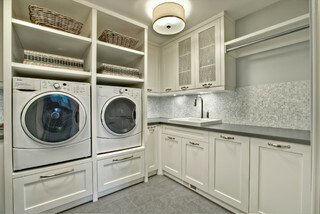 It would b interesting to know where the laundry is dried - inside or outside, or if it's all tumble dried. There's storage for the washing baskets and detergents. 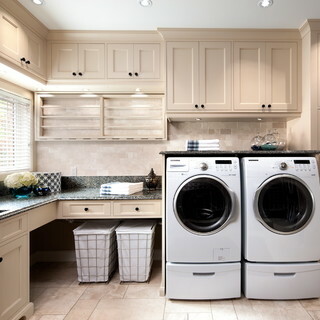 I wonder where the sorting hampers are in this layout - maybe those baskets under the appliances but they look a bit small for that purpose since a laundry room this size is most likely in a family home. It's great to see some design thinking applied to the task of drying our laundry. Surely not everyone out there tumble dries every single piece of clothing!! Just eyeballing this I'd estimate there's about 20ft of drying length. That's enough to dry a small load of laundry. But is 20ft of drying space enough? Probably not. If you're anything like me the laundry gets batched up and I'm more likely to do more than one load in one day then I'll have a day off. Or you've a big family and your washing machine never stops. The only problem with that hanging bar (and again this is just eyeballing because I don't have the measurements) is that I think there would only be room to hang a shirt for a six year old without the bottom of the shirt crumpling up onto the counter. 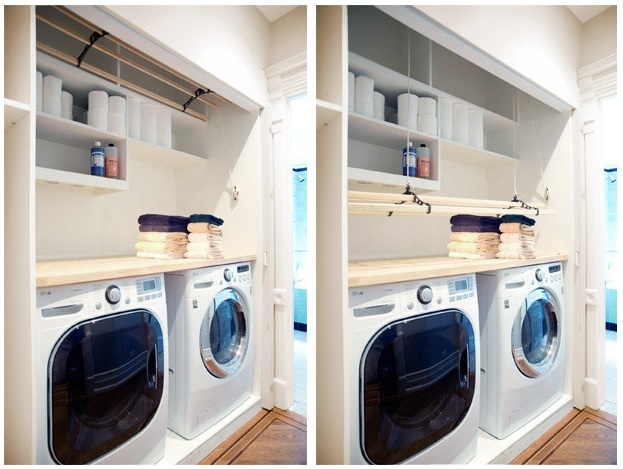 Here's a laundry room with a hanging bar at a good height for shirts. I wonder if there's any other drying facility in this laundry room? I think the area to the right of the appliances would be a great place to install a full height cupboard for drying purposes, or a drying cabinet. Those hampers on the floor would be very annoying after a while - they need their own space, not to be just drifting on the floor. Now I am guessing that those full height lower cabinets on the right hand side of the picture are laundry hampers for sorting and storing laundry before washing. You don't see many laundry room pictures will generous sorting hampers. 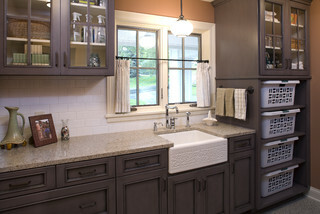 Those grills on the two upper cabinet doors are perfect if you want to build yourself a drying cabinet. It's easy - just find a drying rack that is roughly cupboard sized and put it into a cupboard with a grill to allow for adequate circulation. Here's another way to store generous sized hampers - under the folding surface. Unless there's a great user for those drawers under the folding surface I'd be happy without them for bigger hampers. Those baskets over on the right hand side of the picture would be ideal for sorting and storing pre-wash. I think they'd serve even better as a place to put everyone's clean laundry so they can collect it and put it away themselves. That would save me a job! A ceiling hanging arrangement (called a Shiela Maid in the UK) can add much needed hanging space - and each hanging length can handle bed linen or towels. 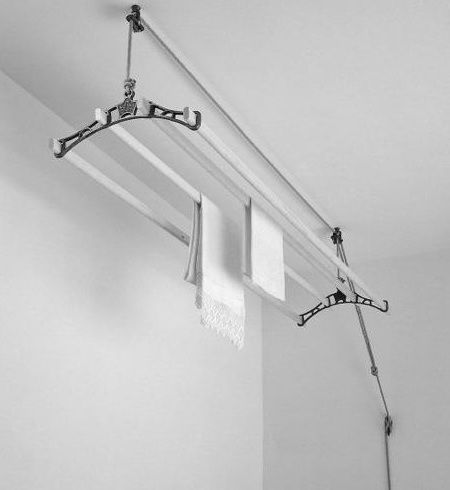 You can get this type of drying rack in different lengths (you can buy one just a bit longer than you need and cut the wooden slats down to your custom dimensions since the wooden slats just slide into the iron holders. You can get them with different numbers of bars as well 4, 5 or 6. If you want a more modern looking design those are available as well. 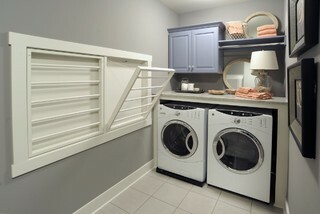 In this laundry closet designed by Elizabeth Roberts Design the sheila maid is hidden away when raised rather than being suspended from the ceiling in the corridor. 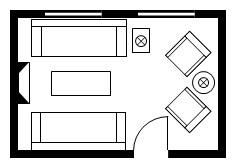 The appliances here are American and the depth allows room for shelving and the shiela maid. Now that I think of it I've seen several films that feature scenes with hanging sheets - some romantic encounters, some horror films - why do movies directors like a hanging sheet so much? 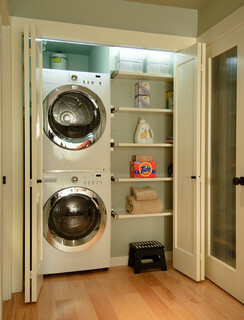 The shelves in this laundry closet make this space much more functional. I hope this home owner has some other area in the house where they can sort, dry and fold their clothes.